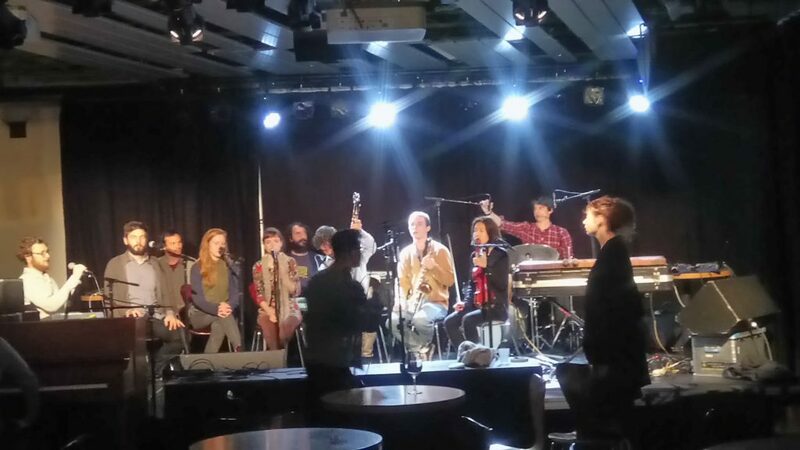 This session was conducted as part of preparations to the larger session in UCSD Studio A, and we worked on calibration of the analysis methods to Jordans double bass and vocals. Some of the calibration and accomodation of signals also includes the fun creative work of figuring out which effects and which effect parameters to map the analyses to. The session resulted in some new discoveries in this respect, for example using the spectral flux of the bass to control vocal reverb size, and using transient density to control very low range delay time modulations. Among the issues we discussed were aspects of timbral polyphony, i.e. how many simultaneous modulations can we percieve and follow? Since the crossadaptive project involves designing relationsips between performative actions and sonic responses, it is also about instrument design in a wide definition of the term. Some of these relationships can be seen as direct extensions to traditional instrument features, like the relationship between energy input and the resulting sonic output. We can call this the mapping between input and output of the instrument. Some other relationships are more more complex, and involves how the actions of one performer affect the processing of another. That relationship can be viewed as an action of one performer changing the mapping between input and output of another instrument. Maybe another instrument is not the correct term to use, since we can view all of this as one combined super-instrument. The situation quickly becomes complex. Let’s take as step back and contemplate for a bit on some of the separate aspects of a musical instrument and what constitutes its “moving parts”. One thing that has always inspired me with electric and electronic instruments is how the sound of the instrument can be tweaked and transformed. I know I have many fellow performers with me in saying that changing the sound of the instrument completely changes what you can and will play. This is of course true also with acoustic instrument, but it is even more clear when you can keep the physical interface identical but change the sonic outcome drastically. The comparision becomes more clear, since the performative actions, the physical interaction with the instrument does not need to change significantly. Still, when the sound of the instrument changes, even the physical gestures to produce it changes and so also what you will play. 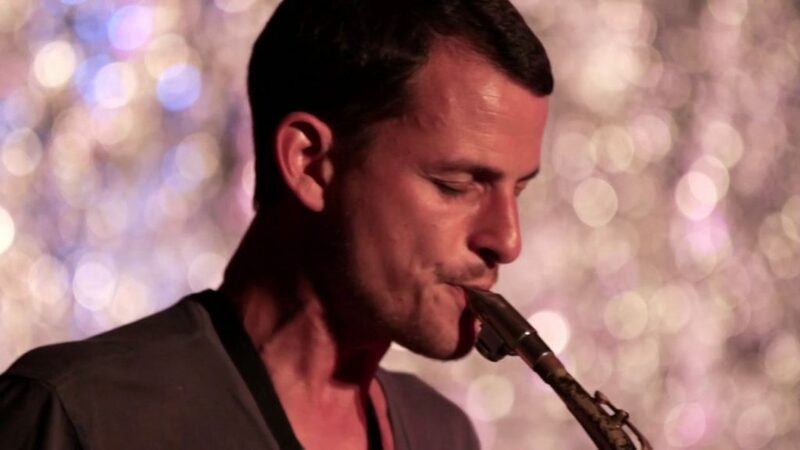 There is a connection and an identification between performer and sound, the current sound of the instrument. This als oextends to the amplification system and to the room where the sound comes out. Performers who has a lot of experience playing on big PA systems know the difference between “just” playing your instrument and playing the instrument through the sound system and in the room. In this context, I have also mused on the subject of how much an instrument ‘does for you’. I mean, automatically, for example “smart” computer instruments that will give back (in some sense) more than you put in. Also, in terms of “creative” packages like Garageband and also much of what comes with programs like Ableton Live, where we can shuffle around templates of stuff made by others, like Photoshop beautifying filters for music. This description is not intended to paint a bleak picture of the future of creativity, but indeed is something to be aware of. In the context of our current discussion it is relevant because of the relation between input and output of the instrument; Garageband and Live, as instruments, will transform your input significantly according to their affordances. The concept is not necessarily limited to computer instruments either, as all instruments add ‘something’ that the performer could not have done by himself (without the external instrument). Also, as an example many are familiar with: playing through a delay effect: Creating beautiful rhythmic textures out of a simple input, where there may be a fine line between the moment you are playing the instrument, and all of a sudden the instrument is playing you, and all you can do is try to keep up. The devil, as they say, is in the delays! There is also a common concept among musicians, when the music flows so easily as if the instrument is playing itself. Being in the groove, in flow, transcendent, totally in the moment, or other descriptions may apply. One might argue that this phenomenon is also result of training, muscle memory, gut reaction, instinct. These are in some ways automatic processes. Any fast human reaction relies in some aspect on a learned response, processing a truly unexpected event takes several hundred milliseconds. Even if it is not automated to the same degree as a delay effect, we can say that there is not a clean division between automated and conteplated responses. We could probably delve deep into physchology to investigate this matter in detail, but for our current purposes it is sufficient to say automation is there to some degree at this level of human performance as well as in the instrument itself. Another aspect of automation (if we in automation can include external events that triggers actions that would not have happened otherwise), or of “falling into the beat” is the synchronizing action when playing in rhythm with another performer. This has some aspects of similarity to the situation when “being played” by the delay effect. The delay processor has even more of a “chasing” effect since it will always continue, responding to every new event, non stop. Playing with another performer does not have that self continuing perpetual motion, but in some cases, the resulting groove might have. So when performing in a crossadaptive situation, what attitude could or should we attain towards the instrument and the processes therein? Should the musicians just focus on the acoustic sound, and play together more or less as usual, letting the processing unfold in its own right? From a traditionally trained performer perspective, one could expect the processing to adapt to the music that is happening, adjusting itself to create something that “works”. However, this is not the only way it could work, and perhaps not the mode that will produce the most interesting results. Another approach is to listen closely to what comes out of the processing. Perhaps to the degree that we disregard the direct sound of the (acoustic) instrument, and just focus on how the processing responds to the different performative gestures. In this mode, the performer would continually adjust to the combined system of acoustic instrument, processing, interaction with the other musician, signal interaction between the two instruments, also including any contribution from the amplification system and the ambience (e.g. playing on headphones or on a P.A). This is hard for many performers, because the complete instrument system is bigger, has more complex interactions, and sometimes has a delay from an action occurs to the system responds (might be a musical and desirable delay, or a technical artifact), plainly a larger distance to all the “moving parts” of the machinery that enables the transformation of a musical intent to a sounding result. In short, we could describe it as having a lower control intimacy. There is also of course a question of the willingness of the performer to set himself in a position where all these extra factors are allowed to count, as it will naturally render most of us in a position where we again are amateurs, not knowing how the instrument works. For many performers this is not immediately attractive. Then again, it is an opportunity to find something new and to be forced to abandon regular habits. One aspect that I haven’t seen discussed so much is the instrumental scope of the performer. As described above, the performer may choose to focus on the acoustic and physical device that was traditionally called the instrument, and operate this with proficiency to create coherent musical statements. On the other hand, the performer may take into account the whole system (where does that end?, is it even contained in the room in which we perform the music?) of sound generation and transformation. Many expressive options and possibilities lies within the larger system, and the position of the listener/audience also oftentimes lies somewhere in the bigger space of this combined system. These reflections of course apply just as much to any performance on a PA system, or in a recording studio, but I’d venture to say they are crystallized even more clearly in the context of the crossadaptive performance. What about the analytical listener? In one way, we could understand it as a modernist stance that if it is in there, it will be heard and thus it matters. We could also understand it to mean that the changes in the interaction, the thing that performers will do differently in this setting is what is the most interesting. When we hear surprise (in the performer), and a subsequent change of direction, we can follow that musically without knowing about the exact details that led to the surprise. The liveconvolver has been used in several concerts and sessions in San Diego this spring. I played three concerts with the group Phantom Station (The Loft, Jan 30th, Feb 27th and Mar 27th), where the first involved the liveconvolver. Then one concert with the band Creatures (The Loft, April 11th), where the live convolver was used with contact mikes on the drums, and live sampling IR from the vocals. I also played a duo concert with Kjell Nordeson at Bread and Salt April 13th, where the liveconvolver was used with contact mikes on the drums, live sampling IR from my own vocals. 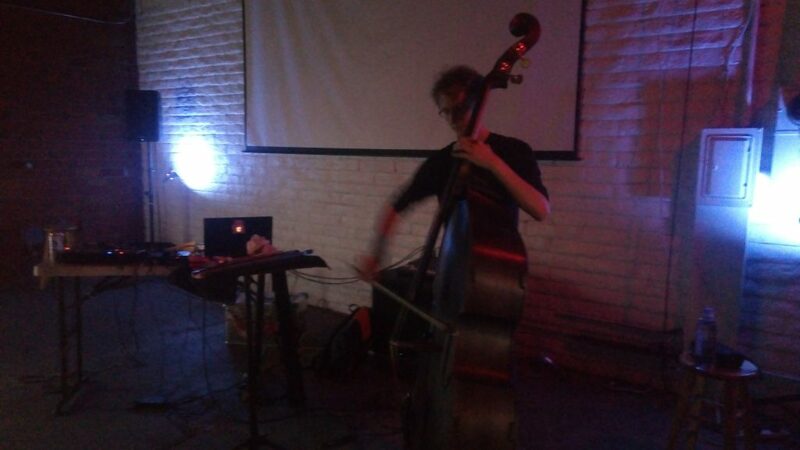 Then a duo concert with Kyle Motl at Coaxial in L.A (April 21st), where a combination of crossadaptive modulation and live convolver was used. For the duo with Kyle, I switched between using bass as the IR and vocals as the IR, letting the other instrument play through the convolver. A number of studio sessions was also conducted, with Kjell Nordeson, Kyle Motl, Jordan Morton, Miller Puckette, Mark Dresser, and Steven Leffue. A separate report on the studio sesssion in UCSD Studio A will be published later. – You, …and the wave”. We can of course prepare for sudden shifts in the music, and construct instruments that will be able to produce sudden shifts and fast reactions. Still, the reaction to a completely unexpected or unfamiliar stimuli will be slower than optimal. An acoustic instrument has less of these limitations. For this reason, I switched to using the Marimba Lumina for the remaning two concerts with Phantom Station, to be able to shape immediate short musical statements with more ease. Creatures is the duo of Jordan Morton (double bass, vocals) and Kai Basanta (drums). 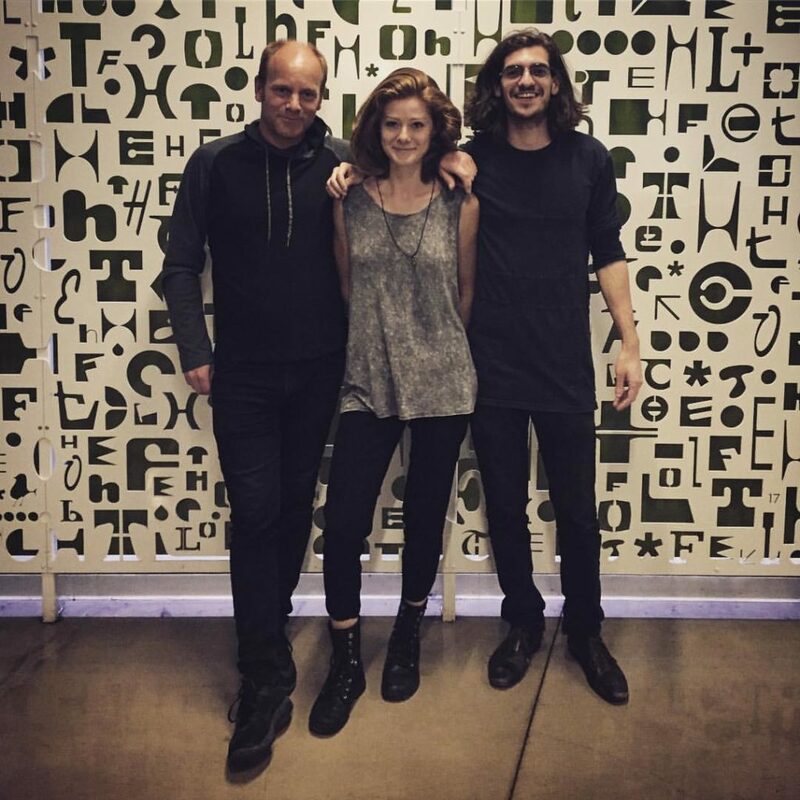 I had the pleasure of sitting in with them, making it a trio for this concert at The Loft. Creatures have some composed material in the form of songs, and combine this with long improvised stretches. For this concert I got to explore the liveconvolver quite a bit, in addition to the regular live processing and Marimba Lumina. The convolver was used with input from piezo pickups on the drums, convolving with IR live recorded from vocals. Piezo pickups can be very “impulse-like”, especially when used on percussive instruments. The pickups’ response have a generous amount of high frequencies, and a very high dynamic range. Due to the peaky impulse-like nature of the signal, it drives the convolution almost like a sample playback trigger, creating delay patterns on the input sound. Still the convolver output can become sustained and dense, when there is high activity on the triggering input. In the live mix, the result sounds somewhat similar to infinite reverb or “freeze” effects (using a trigger to capture a timbral snippet and holding that sound as long as the trigger is enabled). Here, the capture would be the IR recording, and the trigger to create and sustain the output is the activity on the piezo pickup. The causality and performer interface is very different than that of a freeze effect, but listening to it from the outside, the result is similar. These expressive limitations can be circumvented by changing the miking technique, and working in a more directed way as to what sounds goes into the convolver. Due to the relatively few control parameters, the main thing deciding how the convolver sounds is the input signals. The term causality in this context was used by Miller Puckette when talking about the relationship between performative actions and instrumental reactions. Creatures at The Loft. A liveconvolver example can be found at 29:00 to 34:00 with Vocal IR, and briefly around 35:30 with IR from double bass. 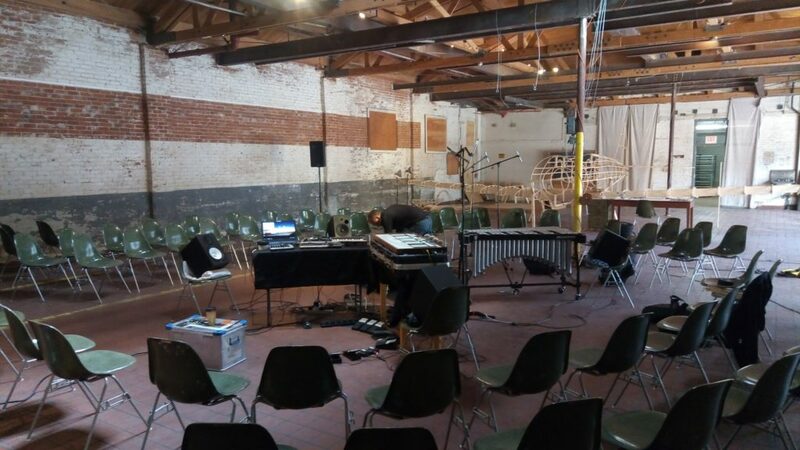 Duo configuration, where Kjell plays drums/perc and vibraphone, and I did live convolution, live processing and Marimba Lumina. My techniques was much like what I used with Creatures. The live convolver setup was also similar, with IR being live sampled from my vocals and the convolver being triggered by piezo pickups on Kjell’s drums. I had the opportunity to work over a longer period of time preparing for this concert together with Kjell. Because if this, we managed to develop a somewhat more nuanced utilization of the convolver techniques. Still, in the live performance situation on a PA, the technical situation made it a bit more difficult to utilize the fine grained control over the process and I felt the sounding result was similar in function to what I did together with Creatures. It works well like this, but there is potential for getting a lot more variation out of this technique. We used a quadrophonic PA setup for this concert. Due to an error with the front-of-house patching, only 2 of the 4 lines from my electronics was recorded. Due to this fact, the mix is somewhat off balance. The recording also lacks first part of the concert, starting some 25 minutes into it. In this duo Kyle Motl plays double bass and I do vocals, live convolution, live processing, and also crossadaptive processing. I did not use the Marimba Lumina in this setting, so some more focus was allowed for the processing. In terms of crossadaptive processing, the utilization of the techniques is a bit more developed in this configuration. We’ve had the opportunity to work over several months, with dedicated rehearsal sessions focusing on separate aspects of the techniques we wanted to explore. As it happpened during the concert, we played one long set and the different techniques was enabled as needed. Parameters that was manually controlled in parts of the set, was then delegated to crossadaptive modulations in other parts of the set. The live convolver was used freely as one out of several active live processing modules/voices. The liveconvolver with vocal IR can be heard for example from 16:25 to 20:10. Here, the IR is recorded from vocals, and the process acts as a vocal “shade” or “pad”, creating long sustained sheets of vocal sound triggeered by the double bass. Then, liveconvolver with bass IR from 20:10 to 23:15, where we switch on to full crossadaptive modulation until the end of the set. We used a complex mapping designed to respond to a variety of expressive changes. Our attitude/approach as performers was not to intellectually focus on controlling specific dimensions but to allow the adaptive processing to naturally follow whatever happened in the music. Gringo and the Desert at Coaxial DTLA, …yes the backgorund noise is the crickets outside. I did two rehearsal sessions together with Steven Leffue in April, as preparation for the UCSD Studio A session in May. We worked both on crossadaptive modulations and on live convolution. Especially interesting with Steven is his own use of adaptive and crossadaptive techniques. He has developed a setup in PD, where he tracks transient density and amplitude envelope over different time windows, and also uses standard deviation of transient density within these windows. The windowing and statistics he use can act somewhat like a feature we have also discussed in our crossadaptive project: a method of making an analysis “in relation to the normal level” for a given feature. Thus, a way to track relative change. Steven’s Master thesis “Musical Considerations in Interactive Design for Performance” relates to this and other issues of adaptive live performance. 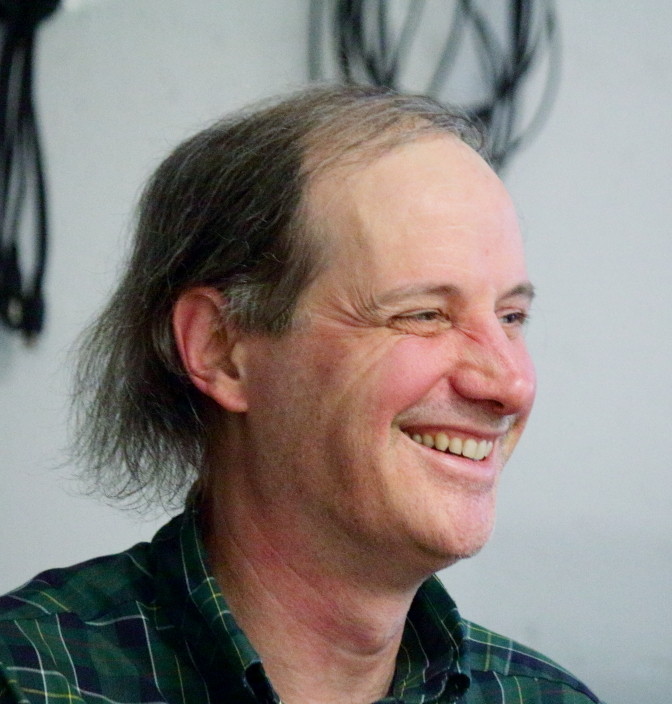 Notable is also his ICMC paper “AIIS: An Intelligent Improvisational System”. His music can be heard at http://www.stevenleffue.com/music.html, where the adaptive electronics is featured in “A theory of harmony” and “Futures”. Our first session was mainly devoted to testing and calibrating the analysis methods towards use on the saxophone. In very broad terms, we notice that the different analysis streams now seem to work relatively similar on different instruments. The main diffferences are related to extraction of tone/noise balance, general brightness, timbral “pressedness” (weight of formants), and to some extent in transient detection and pitch tracking. The reason why the analysis methods now appear more robust is partly due to refinements in their implementation, and partly due to (more) experience in using them as modulators. Listening, experimentation, tweaking, and plainly just a lot of spending-time-with-them, have made for a more intuitive understanding of how each analysis dimension relates to an audio signal. The second session was spent exploring live convolution between Sax and Vocals. Of particular interest here is the comments from Steven regarding the performative roles of IR recording vs playing the convolver. Steven states quite strongly that the one recording the IR has the most influence over the resulting music. This impression is consistent when he records the IR (and I sing through it), and when I record the IR and he plays through it. This may be caused by several things, but of special interest is that it is diametrically opposed to what many other performers have stated. Both Kyle, Jordan and Kjell in our initial sessions, voiced a higher performative intimacy, a closer connection to the output when playing through the IR. Maybe Steven is more concerned with the resulting timbre (including processed sound) than the physical control mechanism, as he routinely designs and performs with his own interactive electronics rig. Of course all musician care about the sound, but perhaps there is a difference of approach on just how to get there. With the liveconvolver we put the performers in an unfamiliar situation, and the differences in approach might just show different methods of problems solving to gain control over this situation. What I’m trying to investigate is how the liveconvolver technique works performatively, and in this, the performer’s personal and musical traits plays into the situation quite strongly. Again, we can only observe single occurences and try to extract things that might work well. There is no conclusions to be drawn on a general basis as to what works and what does not, and neither can we conclude what is the nature of this situation and this tool. One way of looking at it (I’m still just guessing) is that Steven treats the convolver as *the environment* in which music can be made. The changes to the environment determines what can be played and how that will sound, and thus, the one recording the IR controls the environment and subsequently controls the most important factor in determining the music. In this session, we also experimented a bit with transposed and revesed IR, this being some of the parametric modifications we can make to the IR with our liveconvolver technique. Transposing can be interesting, but also quite difficult to use musically. Transposing in octave intervals can work nicely, as it will act just as much as a timbral colouring without changing pitch class. A fun fact about reversed IR as used by Steven: If he played in the style of Charlie Parker and we reversed the IR, it would sound like Evan Parker. Then, if he played like Evan Parker and we reversed the IR, it would still sound like Evan Parker. One could say this puts Evan Parker at the top of the convolution-evolutionary-saxophone tree…. Liveconvolver experiment Sax/Vocals, IR recorded by vocals. Liveconvolver experiment Sax/Vocals, IR recorded by Sax. Liveconvolver experiment Sax/Vocals, time reversed IR recorded by Sax. Since the liveconvolver has been developed and investigated as part of the research on crossadaptive techniques, I had slipped into the habit of calling it a crossadaptive technique. In discussion with Miller, he pointed out that the liveconvolver is not really *crossadaptive* as such. BUT it involves some of the same performative challenges, namely playing something that is not played solely for the purpose of it’s own musical value. The performers will sometimes need to play something that will affect the sound of the other musician in some way. One of the challenges is how to incorporate that thing into the musical narrative, taking care of how it sounds in itself, and exactly how it will affect the other performer’s sound. Playing with liveconvolver has this performative challenge, as has the regular crossadaptive modulation. One thing the live convolver does not have is the reciprocal/two-way modulation, it is more of a one-way process. The recent Oslo session on liveconvolution used two liveconvolvers simultaneously to re-introduce the two-way reciprocal dependency. Liveconvolver experiment Guitar/Vocals, IR recorded by guitar. Liveconvolver experiment Guitar/Vocals, IR recorded by vocals. Participants: Bjørnar Habbestad (flute), Bernt Isak Wærstad (guitar), Gyrid Nordal Kaldestad (voice) Mats Claesson (documentation and observation).